A professionally trained Registered Massage Therapist, classically trained and with a strong background in the medical field.Michael is a highly motivate practitioner hardworking, team-player and very dedicated to his practice. 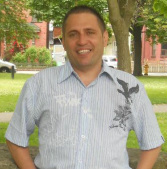 He built his reputation as a RMT in the Spanish speaking and Canadian community and is passionate about his practice. Some of Michael's specialties include: Postural Assessment, correction of the spine Neurological, Vascular and Orthopedic disorders. As part of Michael’s treatment protocol he develops an individual treatment plan to his patients to minimize and eliminate their condition and restore optimal daily life performance.